Original Panel from Peter Follansbee's Blog. I was contemplating the S Scroll carving that I had recently finished, and looking forward to trying a different technique on the next set. 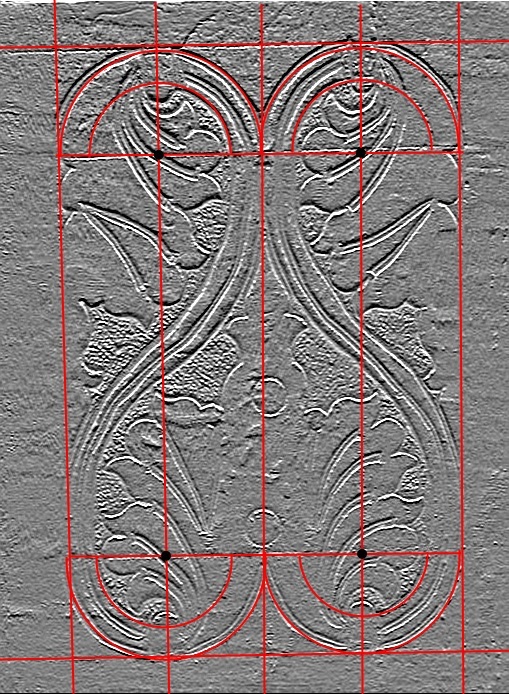 The question in my head was, do you do the outline with ALL chisels, all V-Tool work, or a combination of both. The answer according to Peter Follansbee is “All of the Above”. I did the most recent panel with all chisel outlining only. 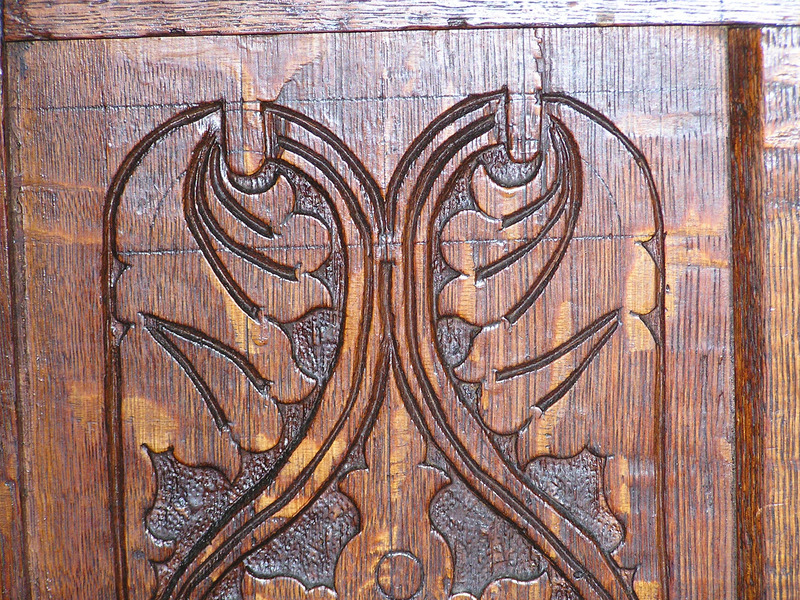 I’m going to do the next panel with V-tool outlining with some chisel work to outline the leaves. I also had a couple of lingering questions on how much layout did I do to before starting, and how much is free hand, etc. etc. Checking on PF’s blog he posted just recently about tool marks present on extant 17th pieces. He did a close up of some marks on a Scrolled panel like I’m working on figuring out. It showed some marks left visible from whatever craftsman made it the first place, which helped me understand some of the layout tricks they used. I did some work with a Paint program to highlight some of the visible marks. 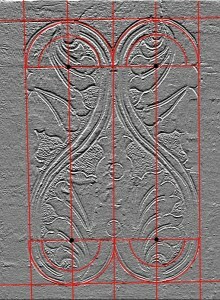 I also modified the original image with “emboss” filter to show the lines better, which accentuates the V tool lines. Then I took the background away to show just what the layout lines would look like when starting from scratch. Which makes it much easier to understand the starting point of the design. 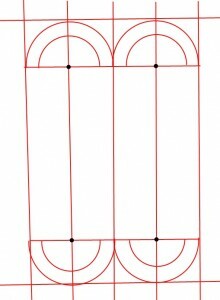 You layout just this part, and you can probably do the rest of the design with just tools with a little practice. I found that to be true after only four of the Scrolls on my previous panel, and I could see how after you do a bunch of them it would become second nature. The half-circles would make it easier for the whole design to be visually consistent, especially if you were doing a whole bunch of these in a row. 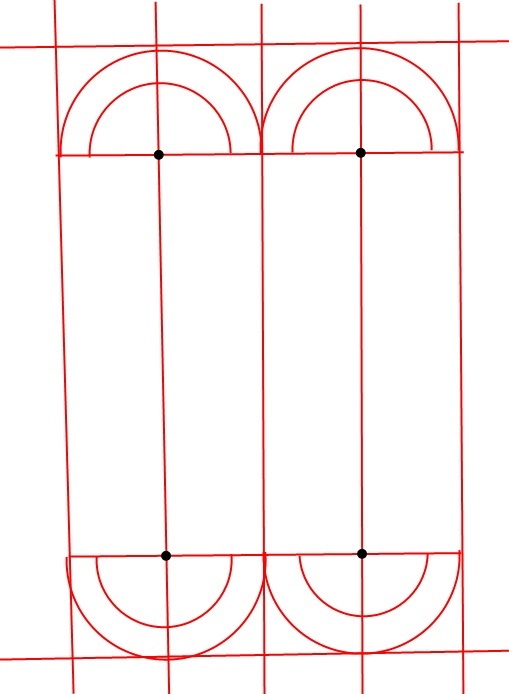 You could do all the similar markings on one setting of the compass, and then set the smaller diameter and do them all in a row. It looks to me… that both the inside and outside of “S” and straight line down the side connecting the top of “S” to bottom used a V-Tool, … but the leaves were stabbed in with various sweep chisels…. The vein’s of the leaves looks like he used a V-Tool and started light then got deeper but then used a very very small chisel(possible a vainer) to stab cut wood at end…as you can see a small stab cut on each end of the vein’s(deep end) ….??? Yup, that’s what it looks like to me too. You can see the beveled edge left by the V tool on the S, and the sharp edge left by the chisel out lining. As for buying more chisels, I was surprised at how much I was able to do with the set I got when I duplicated PF’s set in Swiss made. I didn’t run into anything I couldn’t do with my set on the Scroll panel I did. I did buy a smaller (8mm) #5 chisel to help clear out the waste, but the outline was done with just four gouges. #6 20mm, #8 20mm, #8 13mm, and #5 12mm. I also used a straight chisel for the long middle of the S.
I used the #6/20mm mostly to do the big outlines, the #8/13mm to do the tight circles, and the #5/13 to do some leaf shapes, as well as the bulk of the waste removal. I’m not sure if I used the #8/20mm but I think I used a couple times, maybe? heh. But for the most part I reached for only a few chisels, which surprised me a little. I went to look for some QS oak last weekend, but came up empty at the one store I checked. Trying to find a new source.